It is the only place in the Mediterranean in which the colonial madreporario can be found, from which the coral reefs originate. To the extreme western part of the bay of Porto Conte, on the promontory of Capo Caccia, the same as the Grotta di Nettuno and the underwater one of Nereo, there is another karst cave, the Grotta Verde - also known as that of the 'Altar' - with limestone cliffs dating back to 200 million years ago. On the walls, there are stalagmites and stalactites 12 metres high and covered with plant incrustations. On the floor, there is a saltwater lake that reflects the faint light, creating an evocative greenish light. The water covers various rooms, once dry and 'lived in' by prehistoric man, as is evident in the precious graffiti: the cave was frequented from the Early Neolithic period (6th millennium BC) to the Christian era as a place of worship and a burial site. Thanks to underwater excavations, burials and grave goods were recovered, including round pottery, decorated and coloured with reddish hues. While that of Nettuno extends horizontally almost at sea level, the Grotta Verde is at a height of 75 metres and, moving through a tunnel, it descends almost to sea level. Its entrance can be reached via a flight of steps. Closed to the public, it can be visited by 'speleosub' experts, accompanied by guides, in agreement with the park authority. 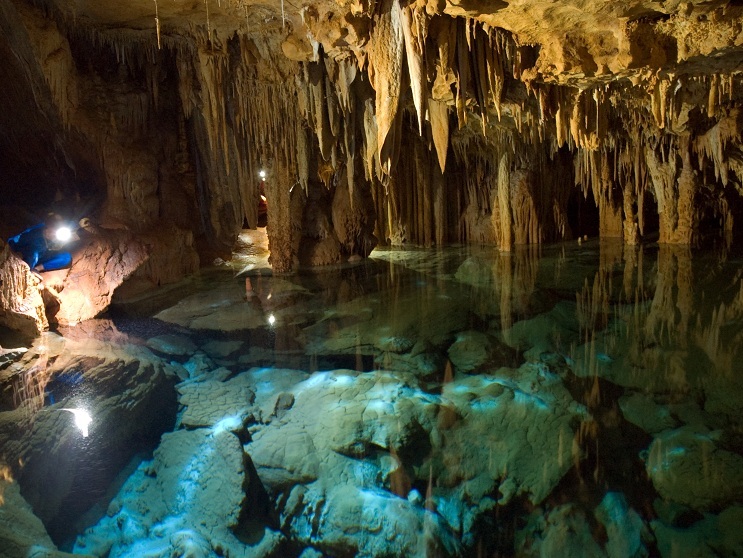 In fact, the cave is part of the Regional Park of Porto Conte that, including the Marine Area of Capo Caccia, occupies five thousand hectares of the territory of Alghero, the inhabited centre of which is 23 kilometres away. The coast, covered in Mediterranean scrub, is made up of sheer cliffs overlooking the sea, with rare plants clinging to the rocks. In the hinterland there are forests, like Le Prigionette, once known as 'Noah's Ark' because fallow deer have been reintroduced, along with Giara horses and little donkeys. The park has spectacular scenery like Punta Giglio and Punta Cristallo, Cala della Barca and dozens of caves, with rare birds flying overhead: above all, the griffon vulture. Then there is the peregrine falcon, the buzzard and the common raven. Furthermore, other archaeological complexes are revealed: Nuraghe Palmavera, the Nuragic sites of Monte Sixeri and Sant'Imbenia and Roman ruins, like the Villa of Sant'Imbenia and the bridge over the Calich lagoon.